Heat-resistant borosilicate glass of the French Press Coffee Maker is explosive-proof to high temperature, and crafted stainless steel surrounds the glass like a coat — durable for years of use. PP plastic handle provides you a safe touch when with hot brewing coffee. And the wide shape delivers a pleasant and solid gripping. Nice looking, but pours very slowly. The French press is the only way that we brew our coffee around here. It extracts the most flavor out of the coffee, minimizes the bitterness, and gives the coffee a smooth, clean flavor. I love how French press are a simple, affordable, and delicious way to brew coffee. 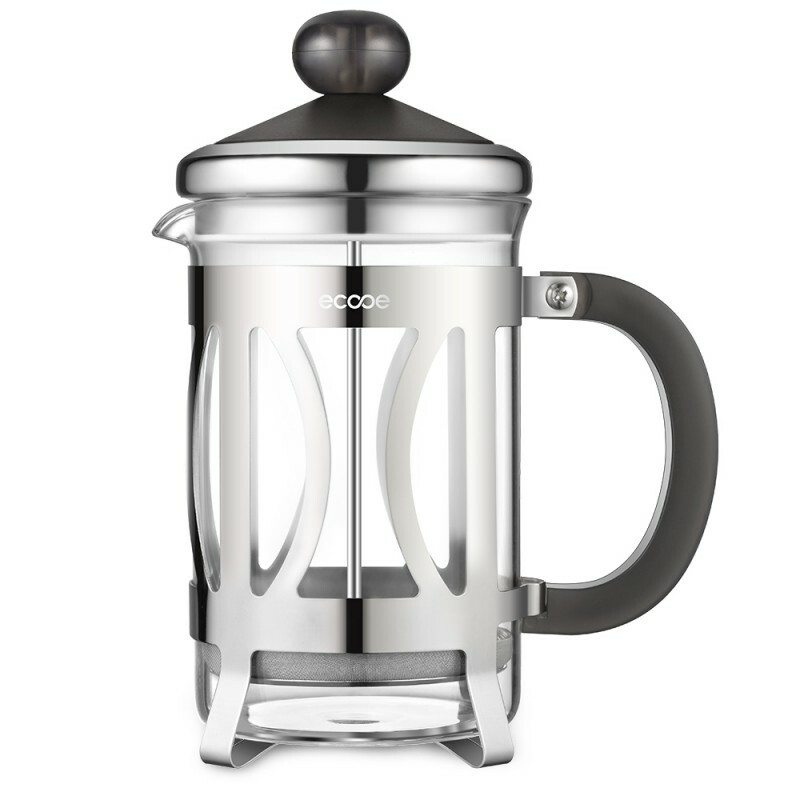 Pros: • This French Press is sleek and modern looking. I really like the glass and steel look. • It comes with extra mesh attachments for when the original wears down. This increases the shelf life of this product. • Simple to use. The plunger goes down smooth. Cons: • Most French press that I have purchased from various locations brew 32-34 oz. Then makes two large travel mugs of coffee, or 4 regular cups to have fore company. This French press only brews 28 oz ( a little less when you factor in the coffee grounds on the bottom). • The lid of plunger does NOT have an open spout area making the pouring of the coffee very slow. So imagine a tea pitcher. You turn the lid to the open hole to pour the tea. This press has no open part. Pouring is not impossible, but it took over a minute to pour the coffee, compared to just a few seconds for our other presses. I tried to take a picture of the coffee at its maximum pour speed. Overall, this is a well built, nice looking French press. It is not perfect, and the price is on the higher side. I will use it as my backup, and it would be a great gift. *DISCLAIMER* This product was provided at a discounted price in exchange for my honest and unbiased review. This is an awesome stainless steel press coffee and tea maker. The stylish frame with clear glass makes the pot an attractive. My husband usually used the Asian stainless steel drip coffee maker. It's took forever to make a cup of coffee every morning. I'm so glad that I ordered this for us. 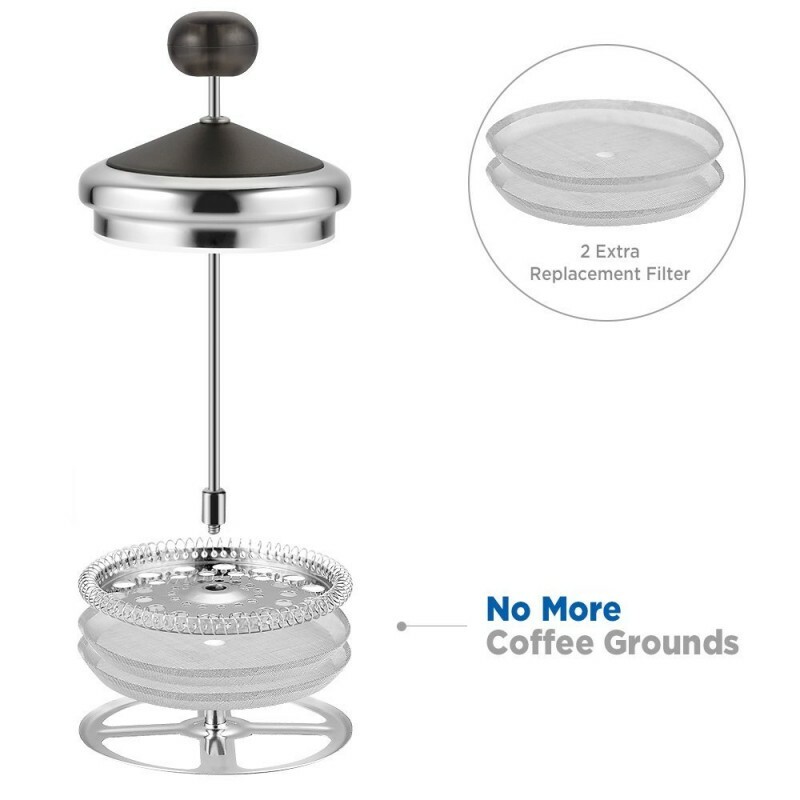 It makes great smooth coffee and tea without paper filters. You can take to work and get an amazing coffee and tea every day. Very simple and easy to use anywhere, you can use it home ,office or even outdoor picnic ,it is much easier to use than a drip coffee maker and it makes much better coffee within minutes. It can serve 2 people in one time brewing. Also I used it for my green tea infuser. The stainless steel maker frame with four corners keeps the pot from wobbling and breaking easily in small impact, while offering heat-proof between the table and the pot. Handle heat resistance so you won't get burn easily. Afterall, I am very pleased with the product. Great quality product. Highly recommended. I received this product for a discounted price in exchange for my honest and unbiased review. I received this Ecooe Stainless Steel French Press Coffee Tea Maker with Best Coffee Press Pot for $.01 cent discount, in exchange for my honest review. 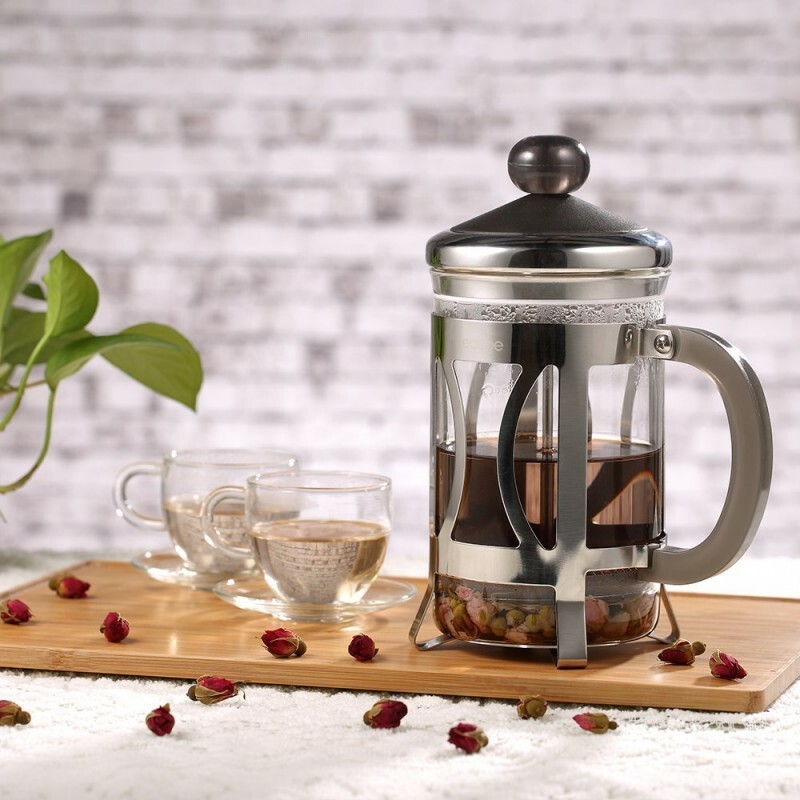 This stainless steel french press has a gorgeous elegant look that can make an amazing gift for any occasion. When I first received this press pot I was very impress of how amazing it looks. I really enjoy how much the french press can hold and the many other types of infusions it can be hold. I really like that when I used this french maker, I was able to travel anywhere with it and it was very lightweight. I really liked that this french press came with two extra filter replacements and 18-month hassle-free warranty. I am wanting to give this french press as a gift to my mother in law and to many of my other family members and friends. PROS: Sturdy. Firm Frame. Easy to use. Elegant Look. Easy to clean. Variety of Uses. Heat-proof Handle. Generous Capacity. Efficient and reliable. Lightweight and portable. Makes an AMAZING gift. Durable stainless steel withstands wears and corrosions. Heat-resistant borosilicate glass is thick and explosive-proof to high temperature. Dishwasher friendly and the stainless steel filter is detachable for thorough clean with ease. Two extra filter replacements, our 18-month hassle-free warranty and friendly customer service. PP plastic handle keep your hand from being burned, while delivering a comfortable and solid gripping. Double dense mesh filters capture any possible coffee grounds yet keeps the aromatic oil and subtle flavors in your coffee. CONS: No complaints as of now. 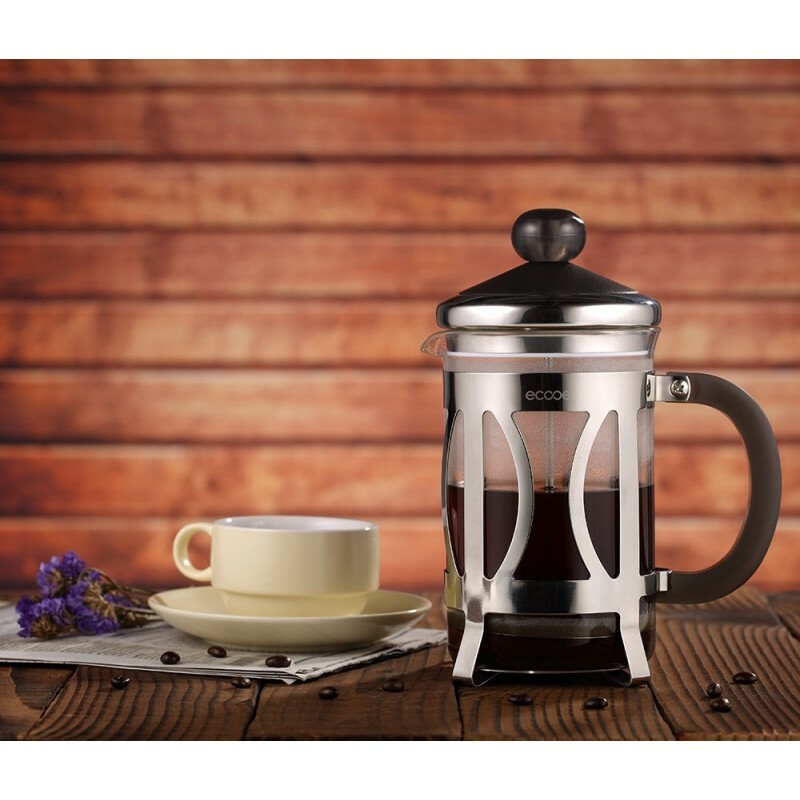 Over ALL, I Highly recommend this Ecooe Stainless Steel French Press Coffee Tea Maker with Best Coffee Press Pot because it makes an amazing gift to family and friends! I received this product at a discount for my honest and unbiased review. 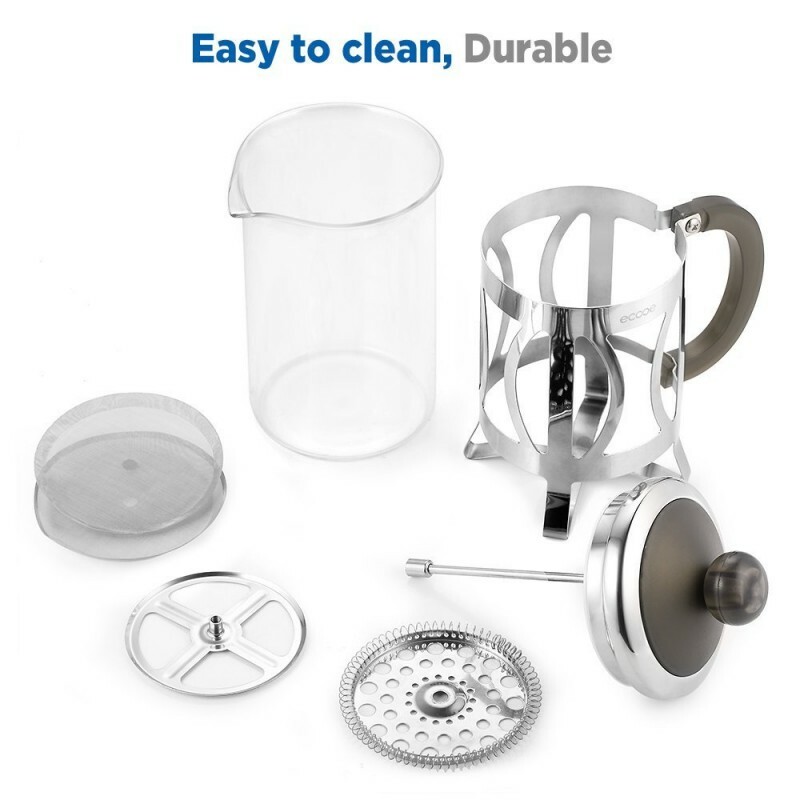 This french press does everything as listed on this amazon purchase page. It holds my tea no matter what temperature, when I pour in to a cup, it keeps the dregs away from my container and keeps my flavor going! This is truly my first experience with a cooling handle that is not made of the same material as the actual stainless steel french press. I am able to hold it and pour my tea without needing to use an oven mitt to keep my hand from burning off. It is rather quite impressive to have a tea pot that is all at one made with plastic, metal and glass. They all come together to give me and my family a rich breakfast and brunch experience on a given weekend. It does not keep tea hot so don't be surprised when your tea cools off after a few hours. Make your tea and drink it. I was unfortunately pulling and pushing the round top to squeeze as much from the tea bags at the bottom of the filter and I wound up dislocating the filter. Luckily, Ecooe provides additional filters and I was able to go back to enjoying great tea. Do not pull the round top - it simply serves to keep the filter in place. I just might get another one for work. Enjoy! I have never really been one to do my coffee (when I drink it), but this french press has won me over. French press definitely tastes better than any instant coffee or Keurig coffee maker. This french press is easy to use and definitely worth the money. This french press was easy to clean once you take it all apart, but there are a few pieces to this one. The glass is thick and the handle is heat resistant, so when you make your coffee or tea you do not have to worry about the glass being so hot that it burns you. This French Press Coffee maker has a nice design and is well made. It is dishwasher safe, but I prefer to hand wash mine. The French Press stands without any issue, it is sturdy and durable. I received this product for free or discounted in exchange for an unbiased and honest review. This does not alter my ability to write a quality review because I know how important reviews are when looking to purchase an item. There's just something about the rich texture of french press that is sooo good in the morning. I like my coffee pretty dark and pretty bold that is why this french press coffee maker is right for me. The design is classic yet contemporary. It has a durable casing of a stainless steel that withstands wears and corrosions. The glass is borosilicate that is very thick. It is heat resistant and explosive-proof to high temperature. It also has dense filters that capture any possible coffee grounds yet keep aromatic oiling my coffee. Plus it has extra 2 mesh as a reserve. The handle is a heatproof which is cool. It is made of PP plastic that has solid gripping. It also has an 18 month warranty, which is great. All you have to have is a grinder, whole roasted coffee bean, hot water, and a nice mug. The fresher it is grounded the better. You will never go back to instant coffee when you taste french press. I love my french press coffee. It is very easy to use, easy to clean. I love it so much. I am very happy with this purchase. I receive this item at a discounted price in exchange of my honest and unbiased opinion. Great Product and Great Price. I really like this product, the stainless steel frame around the glass is really a great added feature. It makes great, smooth tasting coffee and like the fact it comes with extra screens. Its a quick prep to make tea or coffee, It is a very well made sturdy product. the filter system works great, its easy to clean and have had no issues with the whole system it self. A perfect size and doesn't take up much room. I received this product at a discount for my unbiased product test and review of it.